Planning to sell your home where you’ve spent a few good years? Like most homeowners, getting a new roof before selling it might not be on top of your list. But believe us, it could be the best decision you can make on your house-selling journey. Having a new roof is one of the best ways to list your home for more as it could significantly boost your home’s curb appeal as well as increase its appraisal value. However, if you’re having doubts over getting a new roof installed before listing your house for sale, below are some facts you may want to consider. Doesn’t a new roof cost a fortune? The answer may surprise you. Not only are materials more affordable and durable today, but there’s a good chance your roof could be replaced with little or no out of pocket cost. Through your homeowners insurance. Spring is right around the corner. With it comes high winds and possible hail storms. 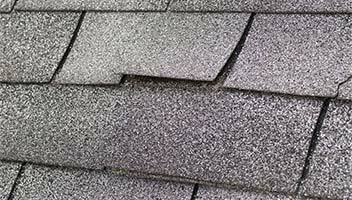 To the untrained eye, small pits in shingles caused by hail might not appear to be an issue. However, these pits remove the protective coating and expose your decking to moisture damage. Likewise, high winds can peel shingles back from the adhesive and also cause water damage to the structure below. In either case, your roof replacement would possibly be covered with you paying just the cost of the deductible. Roofers know this. They will often do a free damage assessment and help you work through the insurance claim process to get a new roof. Check with a reputable local roofer to see if your home suffered from recent storm damage. If so, you might be able to ask more for your home when you take it to market. A new roof can increase your home’s energy efficiency. A brand new roof enables homeowners to market their property as one with optimal performance with regards to energy efficiency because it equates to reduced utility bills. Which of course are important to home buyers who have to deal with the Alabama heat and constantly cycling HVAC units. You can also consider replacing old appliances as it can also improve a home’s energy-efficiency rate. Having a new roof installed can significantly improve your home’s curb appeal. A tired roof that shows signs of an impending replacement is a major turn off to home buyers because they see this as an expense that they could very well avoid by just moving into a different home. On the other hand, a new roof can pique a buyer’s interest as well as make your home stand out, which can then help you close the deal easier and faster. Tempt home buyers with a transferable warranty. A quality roofing company can give you a lifetime transferable warranty on materials and labor that you can pass on to its new owners. And what does this mean? A lifetime of not having to spare dollars for roofing repairs! Who wouldn’t want that right? In most cases, home buyers are willing to pay more to move into a house with a roof covered by a warranty as it gives them peace of mind. A new roof gives your property an edge over other houses for sale. Having a new roof can undeniably improve the look, feel and functionality of your home, especially with the right roofing system and material. For example, metal roofs are sure to last longer than typical asphalt shingles and are better insulators that can help reduce energy consumption thus helping homeowners save on utility bills. Stepping up from there, the sheer cost and durability of a slate roof would almost certainly add instant value to your home. There are slate roofs in Europe that are over 600 years old and still in use. It’s one of the most durable roofing materials out there, but it comes with a high price tag. An old and dilapidated roof is seen as unnecessary expenses by homebuyers because it can leak, lose shingles during a storm, or damage the property’s siding. That can lead to water damage throughout the home. And no new homeowners would ever want that headache. Most buyers wouldn’t think twice about looking for another house if they see this potential issue. On the other hand, a newly installed roof gives buyers peace of mind that they can get their money’s worth as it means less issues and greatly reduced maintenance costs. Convinced that getting a new roof installed before listing your home for sale or rent is something you shouldn’t miss doing? Give us a call today at (205) 631-0101.